Calista Leah Liew: Miss Earth Sabah 2012 - Beauty with a Conscience! 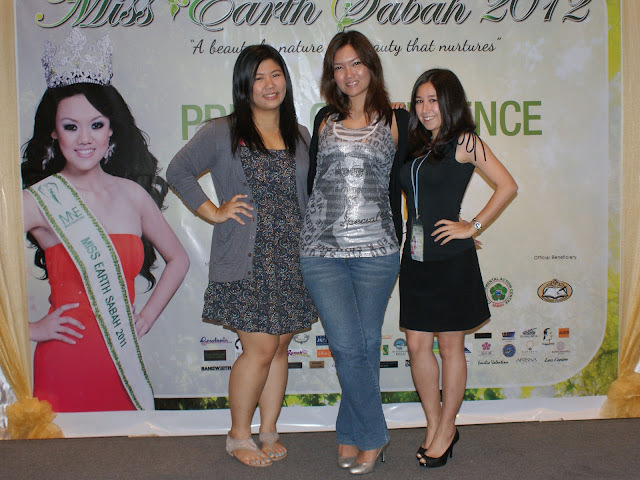 Miss Earth Sabah 2012 - Beauty with a Conscience! Miss May Salitah Naru Kiob, Miss Earth Sabah 2010 was the Master of Ceremonies, and I must say she's a really good emcee! And of course, last year's winner Miss Olivia Vun was also present and shared with the audience her experience throughout her reigning year, with a saying that stayed with me: "People do not care how much you know, until they know how much you care." Miss Earth Sabah emphasizes strongly on environmental protection, with the participants being required to attend various environmental activities and to voice out their green thoughts and ideas. Another thing that Miss Earth Sabah does to help the environment and also our state, is to showcase and promote various eco-tourism destinations within Sabah. Director of MNE Productions Miss Mandy Nandu. Organising chairperson of Miss Earth Sabah 2012 Miss Mandy Nandu, who is also Miss Malaysia Earth 2009 thanked the sponsors and reminded the finalists that they will be the voice of Mother Nature. A good reminder from Miss Nandu was when she said, and I quote, that we are all the benefactors of a cleaner future, and what we fight for today will be the prosperity of our future generations. This is the 3rd year Mandy's company MNE Productions has organised Miss Earth Sabah, and with the past 2 winners making great impact during the national level, I'd say she's doing a pretty good job! After speeches by the VIPs, namely Mr Stefan Willimann, GM of The Pacific Sutera which is the official accommodation sponsor for Miss Earth Sabah, and a representative for YB Datuk Masidi Manjun, Minister of Tourism, Culture and Environment, who gives his full support to the pageant, the finalists had a chance to introduce themselves to the members of the media. Name, age, and green message! Now I have to say, unlike some other pageants, the finalists of Miss Earth Sabah are groomed in public speaking and are also passionate about their green messages, which I find very admirable. This aint no Beauty WithOUT Brains competition! The watering of the Plant. And of course, what's a launch without a ceremony right? The launch of Miss Earth Sabah was officiated by the watering of a plant, and the presentation of a fruit basket to Datuk Masidi's office. Nature's gift to man - fruit! After it was over, the press mingled with the finalists for a while, doing mini interviews while us three Musketeers learned about SRI (which you will read about in this blog soon! ;p) from Mr Allan Zinkler of AgroEcologic Sdn Bhd. Make sure you wait for that as I promise you it's really interesting! Do you see those roasters?? YUM!! Super GT Queens & Engine UP? Turn up the heat! Miss Earth Sabah 2012 - Joanna Marie Faurillo!! Miss Earth Sabah's Got Talent! The Winners of Super GT Queen 2012!! Super GT Queen: What do the judges say? The Arrival of The Super GT Queens in Sabah!